Keeping the yellow for five. The 1988 Tour was tremendous for Steve Bauer. Winner of stage 1, fought valiantly to wear the yellow jersey for 5 days eventually finishing an excellent 4th overall. 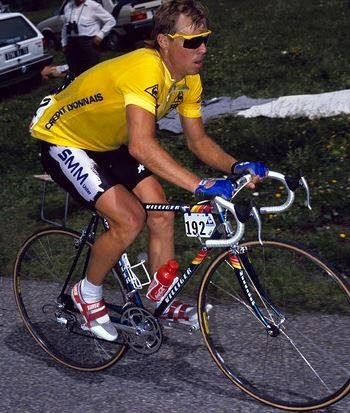 What also made Bauer heroic was he led an unheralded Weinmann-LaSuisse team becoming the second Canadian to wear the yellow jersey (Alex Steida was the first to do so in 1986) ...the stuff of legends.